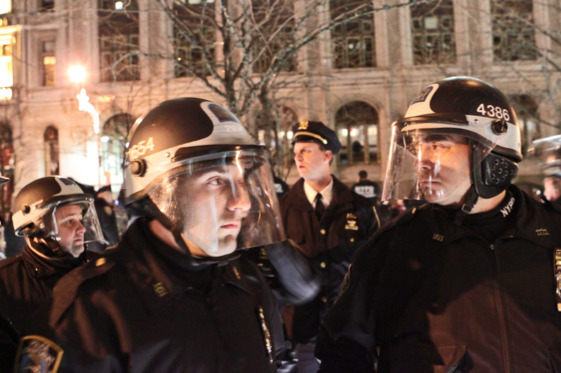 In many but not all senses of the word, the Occupy movement is at war. As I see it, it’s a war primarily of values and ideas against institutionalized inequality, corruption, and injustice, but in some respects and certainly on some occasions, it’s also a war both for and about territory; and the locus of that aspect of the struggle is beyond any doubt Liberty Plaza –also known as Zuccotti Park– in downtown Manhattan. 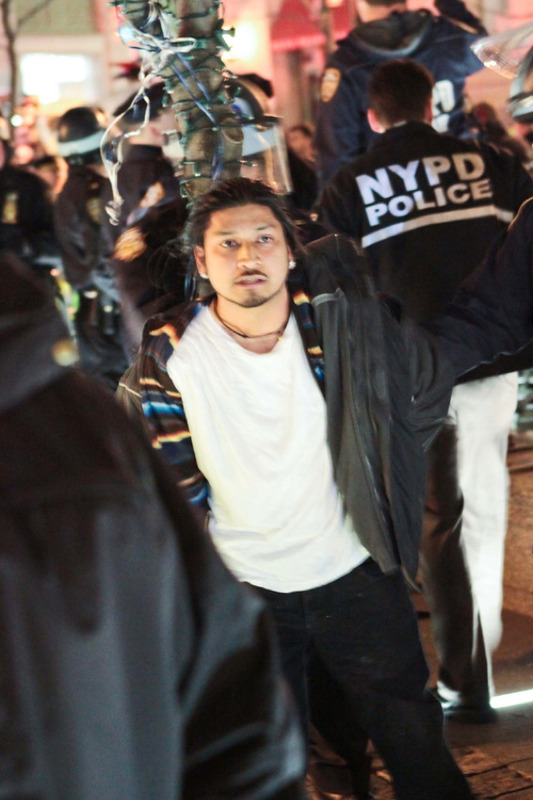 Hundreds of Occupy Wall Street activists were only days away from celebrating the two-month anniversary of the occupation of Zuccotti Park when Mayor Bloomberg deployed the NYPD to clear the park in what can only be called a para-military raid, undertaken during a media black-out in the early morning hours of November 15th. Over five-thousand books and much personal property were destroyed in the raid and most of the other major Occupy encampments throughout the country, including Oakland, Philadelphia, and Los Angeles, were evicted within weeks. 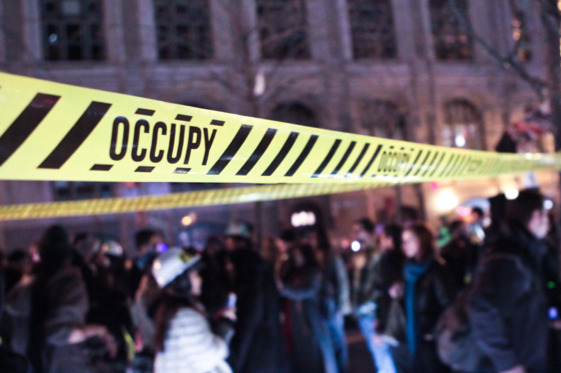 In its battle for territory, the Occupy movement had suffered an enormous setback. But last night, 31 December, 2011, the Occupiers could relish a major, if short-lived, victory in their territorial struggle. 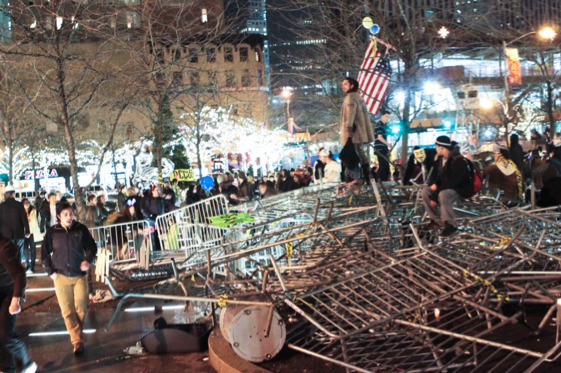 Protesters and revelers at Occupy 2012: Wall Street New Years Eve Celebration wrested many of the steel barricades that had been placed around Zuccotti Park after the eviction and had surrounded it ever since, from the perimeter and threw them into a huge pile in the middle of the plaza. The police, many of them clad in riot gear, were greatly out-numbered and handily out-maneuvered by the protesters, and even their pepper-spray, which they discharged into the face of more than one protester, failed to give them the tactical advantage needed to overcome the crowd or prevent the victory pile of steel barriers from growing larger. 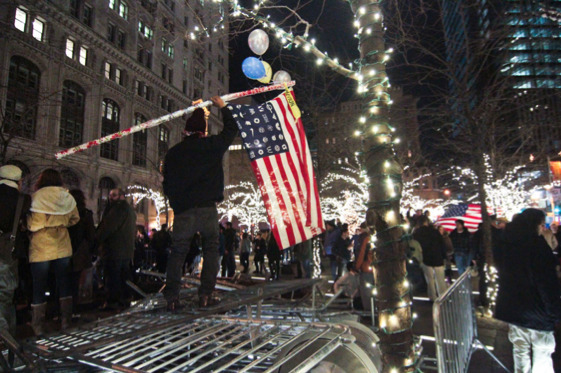 Once the mountain of barricades was complete, some of the protesters climbed triumphantly on top of it with banners and an American flag, while others decorated it with Christmas lights and yellow and black Occupy caution tape. Unsurprisingly, a vibrant and ecstatic drum circle quickly followed. 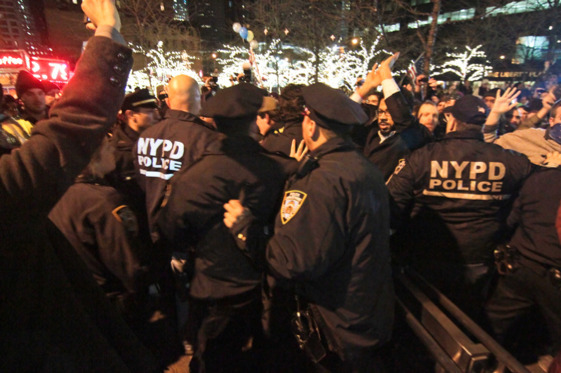 At around 1:00 a.m., dozens of police officers began to converge on the north side of the park and at about 1:30, many of them entered the plaza with riot-cuffs, batons, and helmets and began to make arrests. Two police officers forced a young Hispanic man against a tree and as he was being hand-cuffed he shouted, “Can you tell me why I’m being arrested?! What am I being charged with?” As he was led to a police van, many protesters asked him his name. He yelled in response, “Angel Rodriguez!” In total, sixty-eight people were arrested.